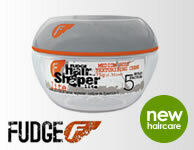 Men-U SLIC Leave-in Conditioner is suitable for all hair types and frequent use. This ultra concentrated formula is one of the most versatile and easy to use conditioners on the market. Used on dry hair it provides a light shine, as a quick and easy styling tool or after washing as an intensive penetrating treatment that will help prevent split and dry ends. Leave in conditioners have come a long way in recent years, and you will be surprised how great your hair feels when you have used this treatment.